This page is suitable for Software Developers; designed to assist businesses obtain information on how to integrate with the Confidis platform. The web services are developed in SOAP. Extending these web services in other technologies is dependent on the requirements of future consumers. Easy access solutions are being developed at the moment to allow minimal integration. The functionality will cater for all payment types. 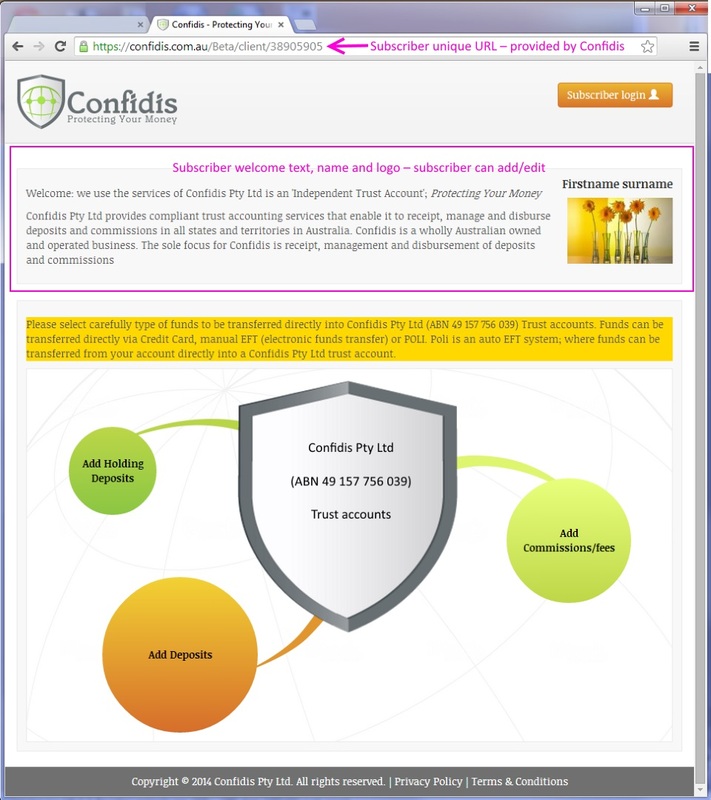 Confidis Pty Ltd (ABN 49 157 756 039) is an ‘Independent Trust Account’; funds can be transferred directly via Credit Card, manual EFT (electronic funds transfer) or POLI. Poli is an auto EFT system, where funds can be transferred from your account directly into a Confidis Pty Ltd trust account. Depending on your subscription/account type, a unique URL and branded page (also known as landing page) are included. See image below. To use/access this branded page, simply create a button/link to your assigned URL. Suggested labels include: ‘Add funds’; ‘Our Trust Account’; ‘Pay with Confidis’, or, created your own. Only agents get an additional URL (New account URL) to help procure/manage their subscribers. Please log into your account for details.